The first visual impression that a map gives to you is important. Does it strike a chord in terms of attractiveness, historic relevance and interest? Does the map look and feel genuinely old? A positive first impression may be confirmed later. However, a first impression which is unsatisfactory is not usually changed for the better. Is the map undamaged and in clean condition? Here are some of the questions about possible imperfections to consider: Are there any wormholes, creases or tears to the paper? Have any of the margins been trimmed and then perhaps renewed? Is the centrefold worn? Can superficial creases or tears be easily repaired? More important, has any of the printed surface been lost? Has the map been repaired before or laid down on a backing? Always look at both sides against the light, and always take a framed map out of its frame for examination. Has an inappropriate adhesive tape been used for repairs, or to secure the map to an old mount? If the map looks too white and pristine it may have been over-cleaned and possibly the paper has been unacceptably bleached. Does the title give the name of the mapmaker, and possibly his imprint? There may also be a named dedicatee. Sometimes the dedicatee’s title or heraldry may provide a pointer as to the map’s date. Is there an imprint which gives the name of the publisher or map maker and his address? A date may appear in either the title or imprint. Can the name of the engraver be discerned, usually inscribed somewhere along the foot of the map, or within a decorative cartouche? Is there a page number or text on the verso which may help to identify the edition of the atlas or book from which the map derives and hence the date of printing? With the aid of a good reference book, these four indicators may help show whether the map is a first state, or a later issue where some or all of this information has been amended or erased. No great reliance should be placed on the date, which (for instance in maps by John Speed) may be retained for many years after the first printing. Thus, a map can never be older than the date it shows but it may have been issued many years later. Depending on the local knowledge of the viewer, the topographical information on the map should also be scrutinised carefully to determine if there have been additions or amendments. Parts of the map may have been re-drawn or (for instance on nineteenth-century maps) new railway lined inserted. These changes may provide clues as to the map’s actual date. Manuscript annotations on a map’s surface can adversely affect its appearance. Conversely, they may add to its interest; e.g. sailing notes on a sea chart or relevant contemporary marginalia. Provenance marks may be those of an important owner or institutional collection. The paper on which the map is printed should be examined to see if the watermark is discernible. Not all paper was watermarked, and sometimes the detail may be obscured by colour. Some papers (usually post-1800) are conveniently dated. With the help of one of several standard reference works the watermark should if possible be confirmed as appropriate to the date and national origin of the map. It needs to be remembered, however, that genuinely watermarked paper might be stocked and then used many decades after its production. Maps printed from two or more plates may have had the sheets of paper joined to form a larger single item. Are the sheet joins cleanly aligned and is the printing uniform? In the case of wall maps, the sheets are likely to have been laid down on thicker paper or on canvas. Is the backing secure and appropriate in relation to the map’s age and condition? Are the supports (e.g. rollers) strong? Nineteenth-century wall maps were often varnished and this has sometimes led to discolouration and cracking. An appreciation of the historical information on a map will help indicate whether it is an early or a later state. A first state, or one with a short lifetime representing a limited print run, may be of greater value; on the other hand a later state which additional information may be of greater geographical importance. With a few notable exceptions all maps published before the 1830s were printed in black ink only. Colour may have been applied shortly after first printing (contemporary colour) or at any time subsequently. Not all contemporary colour was well applied, and a map apparently in early colour may have been enhanced by a later owner. In addition, the tints may have faded and some colours (especially green) may have eroded the paper underneath or have offset to the other side, symmetrically with respect to the centrefold. The existence of colour offsetting, or erosion of the colour green, is usually a reliable indicator that the colour is old, but lack of these features does not necessarily mean that the colouring is modern. Contemporary colouring techniques varied by country and over time, and there are no absolute rules for evaluating colour in relation to a map’s condition. Also, since the 1950’s many loose maps have been coloured by dealers or by professional colourists (modern colour). Sometimes modern colour is so well applied as to be almost indistinguishable from contemporary colour. In other instances, poor modern colour seriously detracts from a map’s condition. 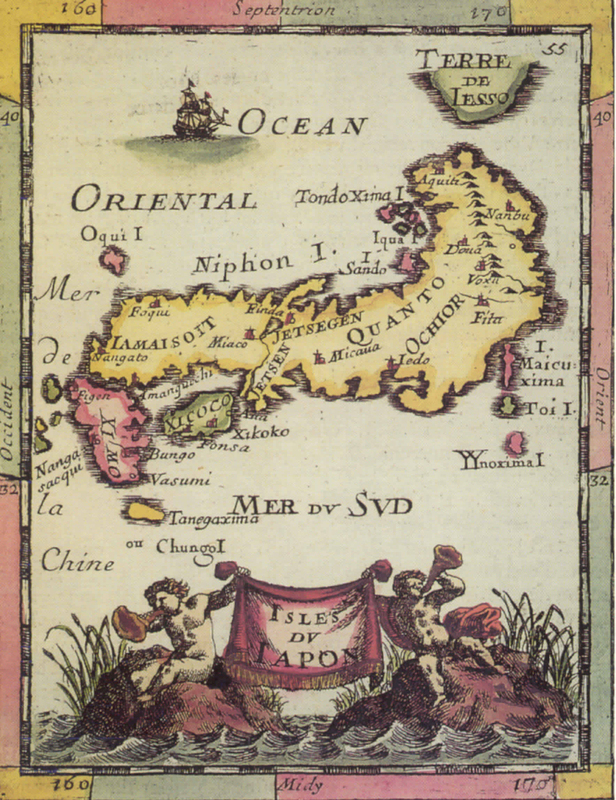 ‘Good’ colour is appropriate to the national origin of the map and its date, and enhances the appearance of a map without obscuring the fineness of the engraving. Contemporary colour was rarely applied to Italian and German sixteenth- and seventeenth-century maps whereas it was more commonly applied to Dutch maps from the 1570s–1730s, and to some French maps of that time. The finest examples were executed by professional colourists and enhanced with gold. German maps by Homann, Seutter and Lotter (first half of the eighteenth century) were typically wash coloured with the cartouches left uncoloured. Early coloured maps from English atlases are scarce, until the latter part of the eighteenth century when tinting became more common. Very few maps derived from books of geography, history or travel were contemporarily coloured, in whichever country they were published. In assessing the colour of a map as a factor of its condition, the viewer must make his or her own judgement as to whether the map’s colour is appropriate to its age and origin, and whether its condition is thereby visually enhanced. In many cases a sharpblack ink (uncoloured) impression may be the most desirable state to have. Is the paper discoloured by overall browning? Are there any stains such as those caused by wetness or candle wax? Can such stains be removed without causing wider damage? Is there any evidence of off-setting of the printing ink or of the colour pigments, if the map is coloured? Does text printed on the back of the map show through because of the thinness of the paper? Little can be done about these last two defects. Has the paper become brittle (e.g. as in the case of many nineteenth-century maps) or has the paper been eroded by colour pigments (typically oxidation of the old copper sulphate used for the green pigment in sixteenth- and seventeenth-century contemporary colour)? Is the printing dark and sharp? Be cautious about accepting a weak, faded or blurred printing impression. It is likely to be either a late state from a worn plate or a poor quality pull, resulting from insufficient ink or inadequate printing pressure. But bear in mind that in general printings from wood blocks are likely to be less sharp than those from copper or steel plates. It is for each viewer to determine whether a map, whatever its condition, represents value for money. Seekers after mint condition, as in all antique fields, usually have to pay a high price. Maps were made to be handled, and evidence of fair wear should not necessarily discourage a purchaser. There may be chance to upgrade the quality by buying an example in finer condition later on.